This Week's TV: One of our favorite animated movies of all time gets a TV show! One of the coolest animated films of all time is getting a weekly TV show — and here's your first taste. Plus you can relive the amazing landing of Curiosity on Mars, with a TV special that gets up close and personal with high-quality reconstructions of every stage of the landing. Plus both Futurama and Morgan Freeman are delving into the meaning of existence, back to back. Gravity Falls is back! And Warehouse 13's Eddie McClintock faces... the Boogeyman. Check out brand new clips and previews from all of this week's TV, below. 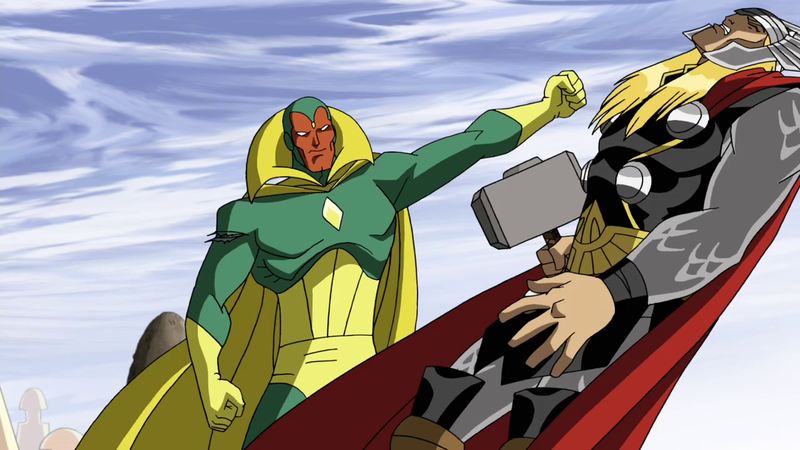 Top image: Avengers: Earth's Mightiest Heroes. It's a whole episode starring B-Mo, that cute little guy. In "B-Mo Noire,"
When Finn thinks he's lost a sock, B-Mo is covertly on the case. Awwww. That's followed by a new Regular Show, a new Annoying Orange, and a new Mad. Pete and Myka require the need of the rest of the team when they have to track down the remaining artifacts from Sykes' arsenal. And meanwhile, Claudia and Steve are back on the job together, despite some unresolved issues, as you can see in the above clip. Remember how everybody made fun of this show for being about lacrosse? Well, in "Battlefield,"
Scott has to pull double duty by playing in the championship lacrosse game and finding a way to stop Gerard. Check out a promo with an awesome Saul Tigh voiceover. An investigation leads Harken and Hicks to go undercover in a secret, underground Alphas-only Fight Club. Every show has to do its "Underground Fight Club" episode, it's the law. Also on TV tonight: Another brand new Scooby-Doo: Mystery Incorporated on Cartoon Network at 2 PM. This weekly animated series follows the continuing adventures of Hiccup and his dragon Toothless on the island of Berk, along with the band of dragon trainers, all of whom now have dragons of their own! Through their training, the kids are finding out the cool things dragons can do. Not only will they learn more about their dragons, they'll also discover new ones and battle against enemies as they explore worlds they never dreamed existed. In addition, the talented cast from the feature film - Jay Baruchel (Hiccup), America Ferrera (Astrid), Christopher Mitz-Plasse (Fishlegs) and T.J. Miller (Tuffnut) - will lend their voices to the series. This is the first two episodes of the 20-episode first season — with the rest airing this fall. Also on TV tonight: Cartoon Network has another new Scooby-Doo: Mystery Incorporated at 2 PM. Yay, a Bender-centric episode! Bender decides he has no free will because he's a robot — which sounds like a contradiction in terms: How can you decide you have no free will? In any case, he embarks on a quest for the meaning of life, which takes him back to Chapek-7. In its season finale, this show is asking, "Did We Invent God?" Hopefully it will be pointed out at some point that Freeman, himself, could well be this generation's most iconic representation of the Supreme Being thanks to those "Almighty" movies. In any case, Freeman himself has already given his answer — and it's surprisingly blunt. Also on TV tonight: Still another new Scooby-Doo on Cartoon Network at 2 PM. A new Johnny Test on Cartoon Network at 7:30, followed by a new Ninjago: Masters of Spinjitsu at 8 PM. The hour-long special includes incredible animation that breaks down each phase of the landing like a scene out of a blockbuster sci-fi movie. Created by Dan Maas, the acclaimed animator who did the IMAX "Roving Mars" and NGC's Emmy winner Five Years on Mars, vivid photorealistic CGI simulates Curiosity's entry into the atmosphere as a massive parachute deploys, rocket thrusters fire up and a sky crane safely lowers the rover to the ground. It all happens faster than the time it takes to send one radio command from Earth, so every step is preprogrammed and the rover is completely on its own, without any aid from NASA controllers. With in-depth, behind-the-scenes access to the elaborate project - which took eight years from conception to touchdown - Martian Mega Rover also captures the gripping human drama behind every stage of this mission. Emmy award-winning producer Mark Davis spent years embedded with the engineers and scientists at NASA's Jet Propulsion Laboratory (JPL) in Pasadena, Calif., as they struggled with enormous technical setbacks that doubled the budget and delayed launch for two years, before they finally accomplished a scientific dream - the most sophisticated robot ever sent to another planet. Another freaking strong episode — Curtis decides to travel back in time and change the night he got arrested. Seems like a reasonable plan, right? Except there are complications, as you'd sort of expect with time travel. Here's a wee clip. Also on TV tonight: Once again, Cartoon Network has a brand new Scooby-Doo at 2 PM. Plus there's a brand new Wilfred on FX at 10 PM. "Double Dipper" - When Stan throws a big weekend party to promote the Mystery Shack, Dipper uses an off-kilter copy machine to make clones of himself so he can impress Wendy. Meanwhile, Mabel stands up for her friends and fights for the Party Queen title in their honor. Yet another zany pun-filled episode title, "The Girl Who Fae'd With Fire." It's an episode about "Alien Castaways." Maybe the aliens will build a radio out of coconut shells or be chased around by Alien Bigfoot, or maybe the Alien Millionaire will cast a gimlet eye at Alien Maryanne. Etc. etc. Also on TV tonight: Yet again, Cartoon Network has... wait for it... a new Scooby-Doo at 2 PM. Plus there's a new My Babysitter's a Vampire on Disney at 7:30. A group of young boys inadvertently free the creature from captivity. Going on a rampage, the Boogeyman, whose origin dates back to the time of Genesis, targets an innocent child - whose father is the town Sheriff (Eddie McClintock). Boogeyman also stars Emma Samms (General Hospital). It's an extra dose of the McClintock! Check out a promo. Did anybody watch last weekend's "The Science of Doctor Who"? Was it just five minutes of clips of Matt Smith spouting jargon, followed by 55 minutes of people laughing? Anyway, this week, it's a look at the women on the show — mostly the female companions and assorted female characters from the new series, not the classic version, by the look of it. There's no trailer for this show, but here's John Barrowman talking about how he'd like to be slapped around by any of the show's various female companions. John Noble isn't going to sort out whether God exists for you, but he is going to explain "Medusa's Heroin." Which has got to be worth something, right? Another Sunday morning double bill — this time featuring our favorite weird little wrinkle in the Marvel Universe, Damage Control. Plus it's time to have some words with Ultron! "Damage" - When Spider-Man and his fellow teenage super heroes cause too much damage in a super villain fight, Nick Fury assigns them to work with the super clean up company, Damage Control, but Spidey's clean up duty uncovers a villainous mystery. "Ultron Unlimited" - The Avengers are attacked by robotic versions of themselves as part of Ultron's plan to replace humanity. Each team member is captured one by one until Captain America stands alone against Ultron and his synthezoid Avengers. The 2nd Mass meets new faces, while Tom comes across his former mentor and professor Arthur Manchester (guest star Terry O'Quinn). But it's difficult to know whom to trust. Maggie begins to realize that Pope may not be sticking with the group very long. And Tector embraces his military past. Bill launches a public-relations campaign about the rise in vampire violence that's favorable to the Authority, though Nora has a hard time selling it to Eric. Meanwhile, Jason discovers a mysterious scroll that could help explain his family's history; Pam and Tara contemplate orders from the new sheriff; Sam and Luna look for Emma; and Russell plans for his future. Also on TV tonight: There's a new Leverage on TNT at 8 PM. Adult Swim has Black Dynamite at 11:30 PM, followed by a new Aqua Teen Hunger Force at midnight and Squid-Billies at 12:15.